Have you ever been tempted to skip out on cooking because you don’t want to make a mess? Every other Wednesday I sigh as I walk into a freshly cleaned house and wonder how can I get around making a good meal and maintaining the kitchen, especially the glass-top stove, as spotless as possible. Takeout isn’t an option – most of the time. Quick look at the freezer…. I don’t feel like defrosting anything. Opening up the pantry… a half-full bag of arborio rice? Chicken stock? I like risotto because in spite of its fancy-pants reputation, it is practically foul-proof. You can flavor it as you like (variety of stocks and seasonings), with whatever aromatics you have on hand. It does take a bit of common kitchen sense as to proportions – how much oil is enough for sauteeing the aromatics, how much liquid should be used for the rice, how much cheese is too much cheese… but once you master a basic recipe, you can improvise and play! (This is my third post on risotto out of… not that many. I rest my case). Warm up cooking liquid and enhance flavor with spices or aromatics. Add liquid by the ladlefulls stir, leave alone until most of the liquid is absorbed, and stir again. Repeat until rice is cooked. Add butter, cheese, and/or flavored oil, stir and serve quickly. 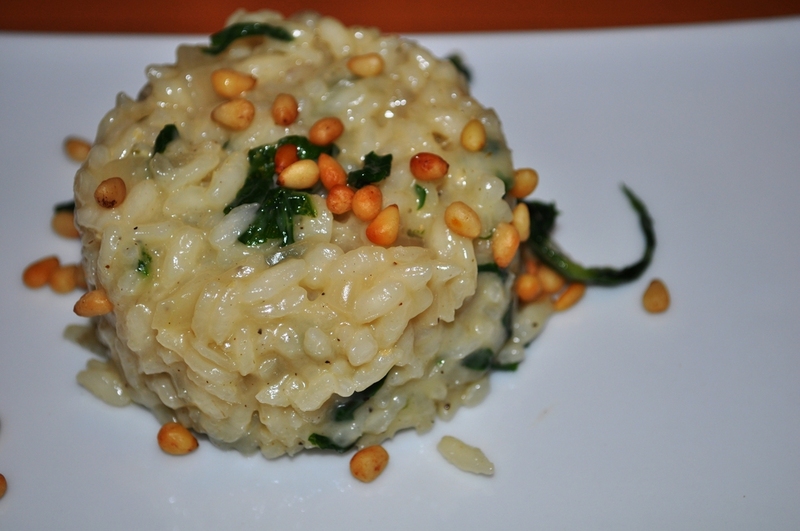 I ended up making a basic parmesan risotto with arugula and pine nuts (for texture). One cup of uncooked arborio rice yielded for three main course servings or four to six side portions. The cooking liquid for this risotto consisted of one can of chicken stock, reinforced with a chicken bouillon cube with an extra three cups of water (for a total of four cups for one cup of arborio rice). I “doctored” it with a bit of fresh thyme. I did have some leftover liquid but it was definitely less than half a cup. While the stock warms up, chop half onion (mine was a left over from a previous recipe) and a shallot or a couple of cloves of garlic. Sautée in a large, shallow pan with a tablespoon or two of olive oil over medium heat until soft. Add the rice, a bit of extra oil if your pan/onions look dry, and stir it until the grains start looking brighter and shiny. There will be some brown bits stuck to the bottom of your pan. If you have wine, add a ladlefull and scrap them all away. I usually have cheap but drinkable Chilean Sauvignon Blanc on hand for these purposes (and to drink while I cook). If you don’t have wine or don’t want to open a bottle for just a bit, just take from your chicken stock – what matters is getting that browned veggie flavor into the risotto. A common myth related to risotto is that you have to stay in front of the stove for half an hour stirring every minute. That’s just not correct. It is important to stir once stock is added and when the risotto looks like it needs more liquid. In the meantime, it can be leftt alone for three/four minutes while doing other prep. I used these time pockets to wash and chop arugula (about two cups – it wilts into very small amounts) and toast pine nuts in the tray of the toaster oven. If you cover the tray with aluminum foil and there will be no need for extra cleanup. When the risotto reaches the al’dente point – it’s still chewy, but not quite undercooked, stir in the arugula (which will wilt quickly) a teaspoon of butter and a third of a cup grated Parmesan cheese. Once you are ready to serve, add in the toasted pine nuts and if you are feeling like you need further spoiling, a quick drizzle of truffle oil. I got a relatively inexpensive bottle at the HomeGoods gourmet section – it helps elevate any meal from the weeknight rotation into an indulgence. I know a lot of the truffle oils out in the market are not the real thing -just olive oils with ‘flavor’ – but they work out just fine for me. Total cleanup tally – one cutting board, a colander, one wooden spoon, one ladle, one medium saucepan, one larger saucepan, two bowls and forks. Mission accomplished. I love risotto and this one looks delicious. I second that. I have several suppers coming up and I will make this. Classic and beautiful :).